After becoming my third favorite film of the 2013 Sundance Film Festival, the hilarious indie comedy A.C.O.D. 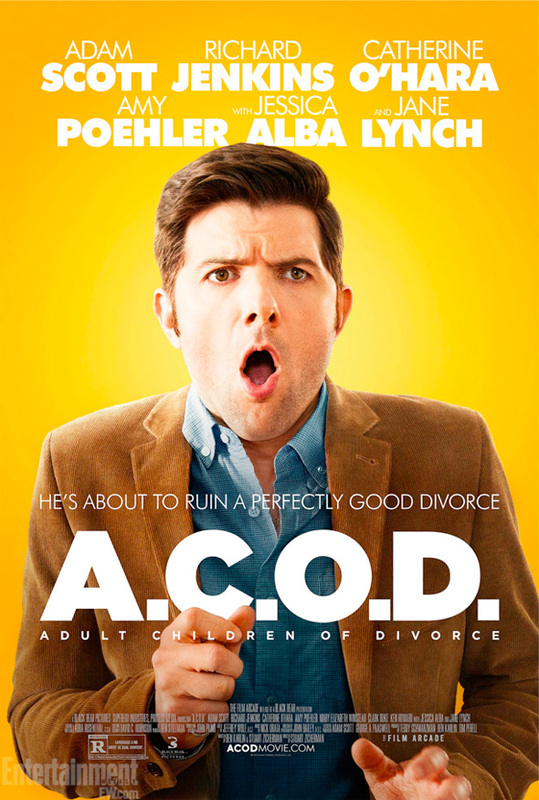 (Adult Child of Divorce) starring Adam Scott was picked up for release by Film Arcade this past April. Now the film is finally coming to theaters sometime this October, and the first poster has been released featuring Adam Scott ("Parks & Recreation," Step Brothers) clearly shocked by something he sees off-camera (and while we know what, we won't spoil it). It's a simple design very similar to the poster for The 40-Year Old Virgin with Steve Carell, but there's not much a poster does to sell a comedy like this. Though A.C.O.D. was my third favorite film, it's important to note that this was definitely the best comedy of the festival. For those who don't have the film on their radar, it follows Carter (Scott), a seemingly well-adjusted Adult Child of Divorce. Having survived the madness of his parents' (Richard Jenkins and Catherine O'Hara) divorce, Carter now has a successful career and supportive girlfriend (Mary Elizabeth Winstead). But when his younger brother (Clark Duke) gets engaged, Carter is forced to reunite his bitterly divorced parents for the wedding, causing the chaos of his childhood to return. The film is directed by Stuart Zicherman ("Six Degrees") from a script he co-write with "The Daily Show" and "Modern Family" producer Ben Karlin and also features Amy Poehler, Jane Lynch and Jessica Alba. As I wrote in my review in January, "The film is full of energy, hearty laughter, witty banter and transcends the romantic comedy subgenre. Stu Zicherman is a fresh new filmmaker who will hopefully bring more great comedy in the years to come, and A.C.O.D. is more than a fine directorial debut; it's a remarkable comedy full of heart and will leave you with a big goofy smile on your face." This is certainly going to be a real crowd-pleaser, and we hope Film Arcade gives it a proper release. Hopefully a trailer isn't too far behind. "clearly shocked by something he sees off-camera." Wow, I wonder what lol. Not interested in seeing Adam Scott with his tiny mouth!